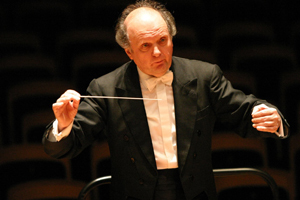 Chief Conductor and Artistic Director of the Rundfunk-Sinfonieorchester Berlin since 2002, Marek Janowski's name is synonymous with the great German orchestral tradition which he interprets in the most enlightened and informed manner. Having established himself at the highest level throughout the musical world, he has also revealed an extraordinary skill in building and training orchestras, creating ensembles of world class reputation and refinement through his meticulous rehearsal technique, innovative programming and commanding musicianship. He has created orchestras of international standing both known increasingly for the quality of their playing and depth of sound. Having spent 16 highly successful years as Music Director of the Orchestre Philharmonique de Radio France between 1984 and 2000, Marek Janowski then moved to become the Artistic and Musical Director of the Monte Carlo Philharmonic Orchestra in 2000. In 2001, Janowski took on the role Chief Conductor and Artistic Director of the Dresden PO and in the following season was appointed Chief Conductor and Artistic Director of the Rundfunk-Sinfonieorchester Berlin. In September 2005 he took up the post of Artistic and Musical Director of the Orchestre de la Suisse Romande, an orchestra which established its golden reputation under the batons of Ansermet, Fricsay, Monteux, Leitner and Kertesz. Marek Janowski's distinguished career was founded in the opera houses of Hamburg, and then in Freiburg and Dortmund where he served as Music Director. It was whilst in Dortmund that he was invited to record the Ring Cycle with the Dresden Staatskapelle, a recording which still holds a pre-eminent place in the catalogue. Guest appearances followed in the major opera houses in Europe and the USA - Vienna, Munich, Berlin, Dresden, New York, San Francisco and Chicago. His success in the concert hall was equally recognised and rewarded by appointments as Music Director to the Royal Liverpool Philharmonic and the Gurzenich Orchestra and by invitations to guest conduct orchestras such as the Berlin Philharmonic, Leipzig Gewandhaus, Dresden Staatskapelle, Boston Symphony, Philadelphia, Philharmonia, the RPO and LPO. Marek Janowski's recording of Strauss' Four Last Songs and Lieder with Soile Isokoski was awarded the Gramophone Editor's Choice Award, "this is a version...to stand alongside the finest" (ODE 982-2).